Step 2: GLUE around the cork lid before putting it on top. I know I didn't take a photo of this but please please please remember to glue the lid or the top will come off and you'll end up with glitter down your front. Step 4: Holding pliers in each hand, pick up one of your jump rings and seperate it by moving one hand towards your body and the other away. Step 5: Loop the jump ring through your bottle's screw top and close it with your pliers. Pop your bottle aside for now. Step 6: Pick up a glass bead and thread it over your gold plated head pin. Step 8: To create the loop you will need to pinch the headpin with your rounded pliers and move your hand so it wraps the metal around the shape of the plier prong (I don't think it's called a prong... but you know what I mean). Finish the loop off by making sure it touches the starting point. Step 9: Open up another jump ring with your pliers, thread it through the loop of your glass bead and close it. Leave this bead aside for a moment. Step 10: Open up the remaining two of your jump rings and thread one of them through the loop of your lobster clasp. Step 11: Thread the jump rings onto each end of your jewellery chain and close. One end should have the clasp on and the other should just be a loop. Close your necklace chain. Step 12: Take your bottle and re-open the jump ring. Find the middle of your jewellery chain (other end to your clasp) and thread it through one of the links, before closing the jump ring. Step 13: Re-open your glass beads jump ring and thread it through one of the links slightly above wear you have attached the bottle. Close the jump ring. Step 14: Sit back and admire your beautiful new glitter bottle necklace! 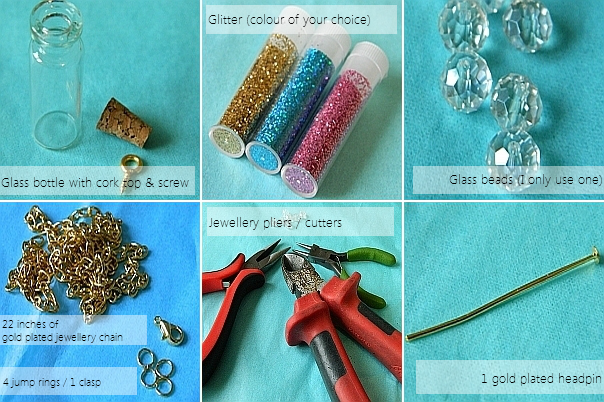 If jewellery making is not really for you and you would just prefer to purchase the final product, you can head over to the Megan Jane Jewellery website where you will find the glitter bottle necklaces for sale. Oh and I'm also currently offering FREE 1st class delivery on all UK orders. Simply enter the code 'UKFREE' at checkout. Amazing I love jewellery tutorials!